If you live in a climate with four seasons, you know that each one has its own particular cleanup needs. Sun, wind, rain, snow, and ice all take their toll and present unique chores to do in your yard. As winter starts to wind down, thoughts naturally turn to what’s next. How do you do a thorough and productive spring cleaning of the front and backyards? Let’s figure out how to get things looking great once all the cold white stuff melts away! Before getting started, it’s important to gather some of the tools you’ll need to do the job. The first part is to make sure you’re taking care of yourself, so let’s go over some basic items to help with that. Appropriate footwear. Sandals or open-toed shoes are not designed for yard work. Sneakers, or even better work boots, will do the job. Sunscreen. Even if it’s not hot, the sun can still burn! Make sure to protect yourself. A brimmed hat. This will help protect your head and also keep the sun out of your eyes so you can see what you’re doing. Knee pads. You might have to be down on your knees for parts of the job. A supply of drinking water. Don’t forget to hydrate! Remember to work safely at all times and be aware of where children and pets may be, especially when using power tools! Having everything on hand ahead of time will definitely make it easier to get the work done quickly! It’s finally time to get started so let’s go through some basic steps. Of course, details will vary based on your yard and particular needs! During the fall, you gathered up most of the leaves that fell on your lawn. But there’s always some that seem to get away or blown onto your lawn after your last effort autumn efforts. And sadly, there’s always litter that shows up – either blown in with the wind or washed down with melting snow. Getting rid of this debris is important for a healthy lawn. The grass underneath needs air as well as the opportunity to dry. Helping the grass feel the warmth of the spring sun early on will help your lawn recover from the winter more quickly. Also, the leaves you gather, along with twigs and other organic materials, make for great compost. Separate out the trash and place everything else in the compost bin for use later on your garden. Spring is also a great time to check for any dead branches on bushes or trees. Ideally you did a thorough check in the fall since falling branches can be a hazard, but spring is a great time to do another review. Some plants and shrubs should also be trimmed back before the growth cycle kicks in. That’s a pretty complex topic and depends on the type of plant. So it’s important to know what you have in your yard and take appropriate steps at the right time of year. 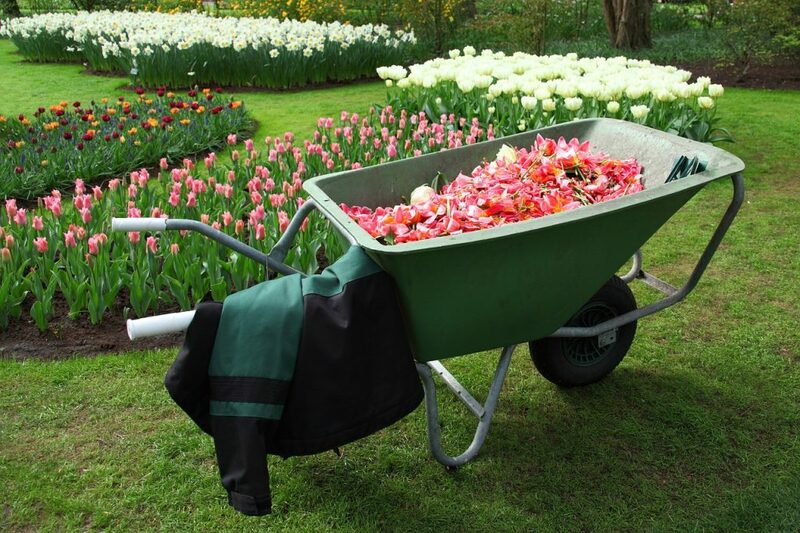 Spring is also time to get ready for planting, and your general cleaning is a preliminary step for that. So make sure the garden bed, too, is cleaned of all debris. If there were any annual plants that you didn’t remove last fall, pull them up now. If you laid winter mulch around your perennials – including those in the garden but also your trees and bushes in the entire yard – make sure the mulch is pulled back from the base a bit. Add fresh mulch where needed and make sure to replace plastic mulch wherever you used it – in general it doesn’t hold up for more than a year! 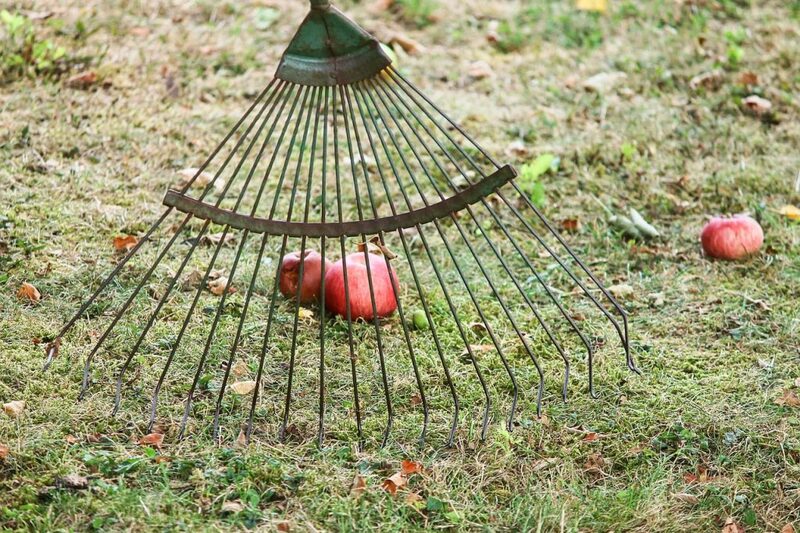 Once the grass has dried – which might mean you have to wait a few days or until the next weekend – rake it thoroughly. That will allow you to uncover any bald spots and remove dead grass. Once you’ve identified those spots, you can reseed to help fill them in. If the whole lawn could stand a thickening-up, you can seed all over as well. Do you have a sprinkler system that you winterized last year? Don’t forget to de-winterize it so it can start working for this year! Turn on the valve at the main feed, then at each feed along the line. Look for any leaks or other problems. At this point, you’ve probably already swept down your hard surfaces. If not, don’t forget them! As you sweep off patios and driveways, and again afterward, look for any damage such as cracks or bricks or pavers that are loose. Stamped concrete is easy to maintain and keep clean. 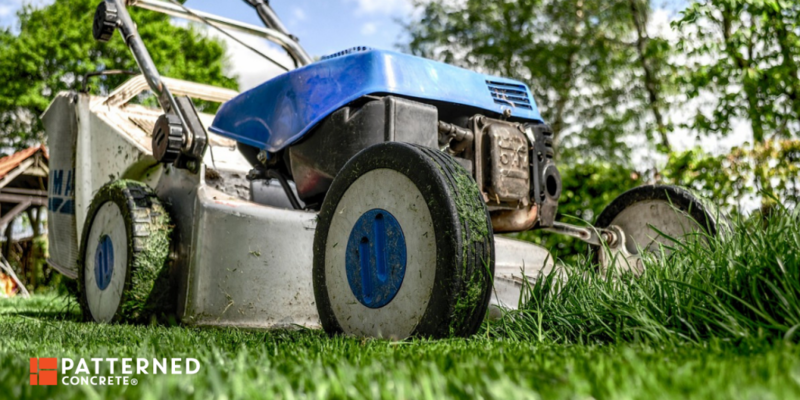 Once you’ve swept it off, you can opt to use a power washer to remove any dirt or other marks. Use a mild detergent if necessary, too. You’ve probably been keeping track of when the surface needs to be resealed, but if you notice irregularities in the appearance now, it could mean that the seal is starting to wear through. Contact us to set up an appointment for the work. Other surface materials each present their own challenges. Things to look out for includes cracks, which usually mean that water is already entering. A small crack in fall could be a lot bigger in spring because water froze inside. This leads to contraction and expansion of the surface. If you have brick or pavers, look out for broken pieces and replace that individual piece. Snow and the settling of the ground can also mean some pieces are now loose; you may be able to set them back in place yourself or have a contractor do it. Winter can really take a toll on wood surfaces like railings and decks. Give your deck a once-over to look for damaged or discolored parts. Wood putty can patch some issues. In more severe cases, you might have to replace a plank or a small section. Of course, metal railings aren’t immune to the weather either. If you have wrought iron or other metal, check for rust and for loose joints. A wire brush, primer and paint will help beautify and preserve areas affected by oxidation. If railings are loose, it’s important to have them repaired for the sake of safety. Spring is a wonderful time of year. The days begin to grow longer, the weather is generally great, and new life springs up all around us. Dedicating a day or so to your front and back yards will help make sure your grass and plants stay healthy and the whole property retains its great looks. It doesn’t take that long, and it’s definitely worth the trouble!